Every so often I check the Japan Camera Industry (CIPA) stats to see just how the camera industry is faring. Visits over the past few years did not bode well for the industry here in the States. The graphs were either static or showed a markedly downward trend, a cloudy forecast. Compact and fixed lens cameras were being eviscerated by the smartphone. DSLRs were dropping, and mirrorless, which showed some growth after a slow start, did not take up much of the slack. I am happy to report that while I am not quite ready to proclaim a turnaround, I have a more optimistic view of the matter. And this is based on the recently released January-July 2017 production and shipment reports. The information from CIPA breaks down shipments to various regions and classes of cameras. I will not dwell on any regions other than the “Americas.” Helpfully, the stats provide two major camera categories. The first is cameras with built-in lenses (bridge, compact, etc.). The second is cameras with interchangeable lenses. 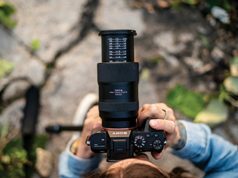 They include single-lens reflex and “non-reflex,” the latter being mirrorless, compact system cameras, and rangefinders with interchangeable lenses. In addition, the reports cover various periods, such as comparable months year to year. My focus here is the January-July comparison year to year, 2016 to 2017. And the Numbers Are . . .
First, a bit of a surprise. 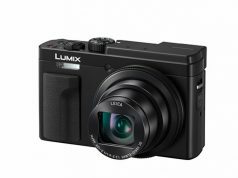 We have all been bemoaning the drop in non-interchangeable-lens compact cameras, given how the smartphone has decimated those ranks. Yet, in the reporting period cited, units shipped went up 13.5% with an (yen) increase of almost 24% in value. We have seen the persistence of the so-called “bridge” camera, and many makers are bringing out new models as we speak, such as the Sony Cyber-shot RX10 IV. Overall, shipments of interchangeable-lens cameras went up 9%, with a 40% increase in value. SLRs did drop a bit in terms of units, about 3%, with a little under a 7% drop in value (more on that to come). However, mirrorless and their ilk show nearly a 90% increase year over year in shipments and a 229% (!) increase in value. We do have to parse the above interchangeable-lens camera numbers a bit—something revealed in the units shipped stats. While mirrorless shows very impressive numbers and gains (and BTW even more so in areas other than the Americas), actual units shipped are still a third (344.5K) of SLR deliveries (1.15 million). I guess you could say that the Electoral College vote goes to mirrorless while the popular vote sits squarely in the SLR camp. 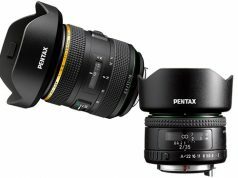 While we’re at it, let’s talk interchangeable lenses. Year-to-year shipments have remained steady. That’s because lenses for mirrorless have taken up some of the slack in the 8% drop in SLR lenses. I should note that CIPA classes lenses as those for “35mm” and those for “smaller” cameras. I am not certain that 35mm means full frame or not. Nevertheless, steady as she goes overall. Well, not quite yet. Word just came down that a recent cover of Time magazine was shot with an iPhone. Sacrilege. On the other hand, there are developments that seem to point to better days ahead. Manufacturers are taking the hint and putting touch-screen controls like swipe, pinch and playback into the mix. And there is a recent trend toward touch-screen shutter in live view mode—a clear appeal to those raised on smartphone operability. Moreover, Canon recently unveiled a full-frame DSLR with just such capabilities, the EOS 6D Mark II. It should be noted that this new, comparatively affordable Canon has been dubbed a “gateway” camera. It is aimed at those looking to shoot with a full-frame sensor. While this may not signal the slow demise of APS-C DSLRs, it might well bode a future trend. Indeed, a recent report quoted a Nikon director as saying “. . . full frame is the trend and if Nikon will go mirrorless it must be full frame.” On the DSLR side, Nikon’s latest offering raises the megapixel bar significantly. While the D850 is priced for the pro, with specs to match, it might cut in on digital medium-format’s turf. While “connectivity” was the clarion call a few years back, nearly every camera made today has all the sharing, connectivity functionality one could want, albeit without cell service. This is perhaps a vital aspect that keeps many folks in the smartphone camp. It’s also an unsolvable problem for cameras, so far. Yet there are more LAN options in pro cameras like the D850, via an accessory. In the end, I am convinced folks who care about image quality are not content with the gee-whiz filters and processing algorithms that cram the smartphone app stores, cute though they may be. 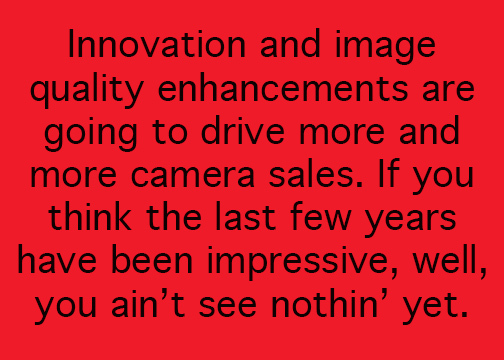 Innovation and image quality enhancements are going to drive more and more camera sales. If you think the last few years have been impressive, well, you ain’t seen nothin’ yet. One interesting development is the idea of partnering the processor in the camera with the computer. Apparently the path is to connect the camera directly to a computer via USB and then have the in-camera processor do the work. This may point to more accurate and refined RAW conversions, as it may avoid “translation” or color management issues. It would also eliminate what now is an often arduous, time-consuming task. I have not had the opportunity to test this yet, as it is slated to show up late this year, but we’ll see. One of my sources of future tech information is the treasure trove of papers presented at IS&T meetings. They are available online at imaging.org. This organization brings together the best and the brightest in the industry for panels, networking and research paper presentations. This is a kind of logical next step in sensors with advanced on-chip processors that would reduce the data (and need for processing) previously delivered to in-camera processors. It would “relax” demands on the processor and speed up data storage and communication. Another presentation covered work on “statistical variations” in RAW image recording and how the authors’ “value error models for all pixels in an image are used to drive a type of texture synthesis which refines the pixel value estimates, potentially increasing both accuracy and precision of each value.” That’s a mouthful, but as I read it, the implications are interesting in terms of image quality and rendition, and, if I may, it feels like a kind of “super-RAW” mode. I was also intrigued by a presentation covering the development of an 8K, full-resolution, 60-fps, 133MP single-chip (CMOS) sensor. The sensor can be used with full-frame lenses. 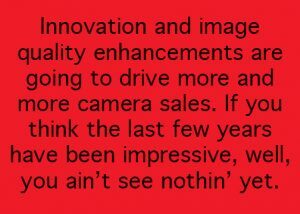 True, as of now all this relies on a 100 Gbps transceiver in a camera that weighs about 15 pounds. However, once a door like this opens, many fascinating things happen. I for one remember when a 1GB memory card cost a thousand bucks and a 6MP camera was big news. Last but not least, the IS&T conference covered VR developments, which some in the industry see as fair game for future growth. I am not particularly convinced about this. One of the stumbling blocks remains the “cybersickness” syndrome I mentioned in a CES follow-up column in this journal a few months back. Another report from IS&T gave, to me, a new acronym for this syndrome: VRISE, or VR-Induced Symptoms and Effects. The authors reported they had developed a head-mounted display (HMD) that they indicate greatly ameliorates this effect. Their solution is a “head lock” method for rotational motions that generate a “Pseudo AR” mode that maintains “fixed visual outside world references” that significantly mitigates VRISE occurrences. In essence, it’s an algorithmic solution that tricks the mind to enable it to wrap itself around an alternative, immersive reality without getting totally spaced out. Other areas of growth include the “instant” camera market, with which Fujifilm has had great success. New Kodak and Polaroid branded products are due out soon, all with low price points. But as we know, instant has always been a razor and blades game, much like inkjet printers. Yet there’s no denying the growth potential there and the embrace of instant by a new generation of photographers. Speaking of analog, I saw a recent announcement that Ektachrome film may be coming back on the scene. And while we’re at it, there are rumors that the Yashica brand may reemerge. So clearly, the industry is not sitting on its hands. Rather than rail against the smartphone, it has embraced the handling innovations the phone offers. 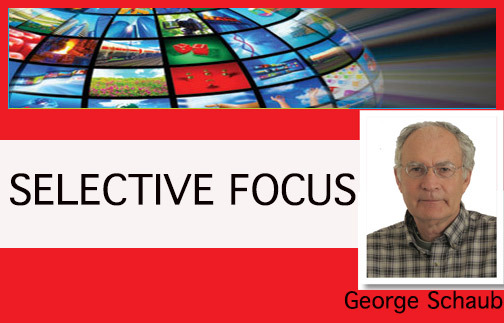 Moreover, it continues to up the ante on image quality and responsiveness of cameras. Yes, “the camera you use is the camera you have with you.” And smartphones are constant companions that have linked us all in a new and exciting visual world. But from what I can gather, with camera sales and shipments steady or on the rise, and new advances in technology right around the corner, now’s not the time to throw in the towel.